In the Governorate of Assiut, Egypt caves are one of the most important morphological features of the Nile Valley landscape. They can be divided into three types: dissolution caves, caves of rock-cut tombs dated from the dynastic period and caves derived from ancient quarries. The variation in the functional role of caves in the area throughout the centuries provides a good example of the interrelationship between man and his environment. The geographic nature of the Nile valley, geological characteristics, the morphology of the caves, and the political and social conditions explain why natural caves have not been exploited since Pharaonic times and why man-made caves, especially caves of rock-cut tombs, were used instead. The characteristics of natural caves could not qualify them to perform new functional roles posed by the ambition of ancient Egyptians to build a great civilisation. Their morphology is 'unengineered' and their sites are 'not selected', compared with the caves of rock-cut tombs whose design takes into consideration the principles of engineering design. Les grottes sont parmi les principales caractéristiques morphologiques observées dans la vallée du Nil au niveau du Gouvernorat d’Assiout, situé en Moyenne Égypte. Elles peuvent être classées en trois types : les grottes d’origine karstique, celles ayant été creusées pour y abriter des tombes de l’époque dynastique et enfin les carrières d’extraction de matériaux. Les différentes sortes de cavité reflètent de manière certaine des usages et des fonctions distincts au cours des derniers siècles et sont un témoignage évident des relations Homme/milieu en Moyenne Égypte. La configuration géographique, les caractéristiques géologiques de la vallée du Nil à cet endroit ainsi que l’évolution des conditions politiques et sociales au cours des derniers millénaires permettent de comprendre pourquoi les grottes d’origine naturelle n’ont pas été utilisées à l’époque dynastique, au bénéfice des cavités creusées dans une strate géologique homogène, qui servaient à abriter les tombes troglodytes pendant l’époque pharaonique. Les raisons de ce choix peuvent s’expliquer par la morphologie des grottes d’origine naturelle qui ne correspondaient pas au modèle ambitieux de développement d’une civilisation importante voulue par les anciens égyptiens. En effet, ces derniers privilégièrent des anfractuosités liées à une faiblesse locale de la roche dans le but de les aménager ensuite en sépulture, leur style architectural « naturel » correspondant mieux aux principes de l’ingénierie pharaonique. 1Caves are considered one of the extraordinary natural features that have played an important role throughout human history, as they provided a suitable and attractive environment for human habitation, especially in prehistoric times (Gamble, 1986; Vermeersch et al., 1994; Hassan et al., 1996; Kuper, 1996; Barber and Hubbord, 1997; Mouret and Ostermann, 2001; Gunn, 2004; Tolan-Smith, 2004; Culver and White, 2005; Kindermann et al., 2006; Darnell, 2008; Mlekuz et al., 2008; Linseele et al., 2009). Moreover, caves clearly reflected the interplay between man and his environment. Therefore, they are considered to be excellent archives of environmental changes (Woodward and Goldberg, 2001; Moeyersons et al., 2002; Goldberg and Sherwood, 2006; Delannoy et al., 2009; Psomiads et al., 2009). Pharaonic civilisation provides considerable examples of the relationship between man and caves. Natural caves are no longer an attractive and suitable environment for use. The ancient Egyptians left natural caves and dug caves in the rock on the sides of the Nile Valley. Man-made caves were conceived for functional purposes that natural caves could not perform, and satisfying the ambition of the Egyptians and their religious beliefs. These new caves were used as rock-cut tombs (Badawy, 1954; Bunson, 2002; El Salam, 2002; Dodson and Ikram, 2008). Burying the dead in tombs is an old Egyptian concept that dates back to the pre-dynastic period, as is the case with Deir Tasa culture (6.8 ka BP) and El-Badari culture at the south east of Assiut (6-6.5 ka BP; Bunson, 2002). However, the digging of tombs on the surrounding scarps is considered to be an obvious change in ancient Egyptians’ view of the environment. While, in the beginning, holes were dug in the ground at the desert margin near the floodplain for protection from floods and resulting swamps (Brunton and Caton-Thompson, 1928; Baumgartel, 1955; Butzer, 1959; Baumgartel, 1960). Subsequent tombs were dug on high scarps, to provide protection against theft and sabotage that prevailed during periods of social and political unrest. Other caves were dug for economic purposes like quarrying during the Pharaonic and Romanic periods (Arnold, 1991; Harrell et al., 1996; Aston et al., 2000). Quarry-caves were used as human shelters in later times. 2Thus, man-made caves have become the most characteristic features of the Nile valley sides up till now. This modification brought about by ancient Egyptians is considered to be one of the earliest historical examples of the role of man as a geomorphological agent in Egypt. Although numerous caves exist along the sides of the Nile Valley, they have not been investigated so for because of several difficulties, including protection issues (archaeological sites), accessibility problems and their use as shelters for criminals and outlaws (Embabi, 2004). The present study focuses on the caves of the middle part of the Nile Valley in Egypt, particularly, in the Assiut governorate. Metropolitan Assiut City lies 375 km south of Cairo (fig. 1). The Nile Valley of Egypt comprises part of the great canyon of the Eonile River, this canyon has been excavated at the end of Miocene period, and its depth in Assiut exceeds 800 m (Said, 1981). The present valley, which is 120 km in length and 15.5 km in mean width, is surrounded by the Eastern and the Western Desert. Its landforms can be classified into four geomorphological units: (i) valley sides, (ii) transitional desert, (iii) floodplain, and (iv) the Nile channel. The valley sides, which have mean height of about 150 m above the floodplain, represent the upper part of the Eonile canyon, whereas the lower parts are covered by fluvial fill which consists of gravel and sand of the Pliocene and the subsequent Nile systems of the Quaternary (Sandford, 1934; Ball, 1939; Said, 1981; Embabi, 2004). The upper scarps comprise rocky terraces whose shape results from the variable hardness of secondary limestone layers. The lower slopes are either covered by talus and composed of concave slopes, or are rocky and asymmetrical slopes affected by dissolution. There are several wadis that are cutting the sides, the biggest one is Wadi El-Assiuty on the eastern side. They originated during the previous pluvial periods. From a geological point of view, the southern part of the Nile valley in Assiut is formed of homogenous, dense and thickly bedded limestone that belongs to the Lower Eocene Drunka formation which overlies the Thebes formation. The northern side is composed of the Lower/Middle Eocene Minia formation, which is made up of well-bedded white to grey limestone (EGSMA, 1981; Said, 1981; Klitzsch et al., 1987). At the foot slopes, there is the transitional desert strip which is characterised by relict Nile terraces. Most of the prehistoric settlements and implements in the Nile valley have been found in this strip (Sandford, 1934; Ball, 1939; Sandford and Arkell, 1939; Butzer, 1959). Between the Eastern and the Western desert strips there is the flood plain. It is composed of recent Nile silt which has been deposited since 8-7.5 ka BP (Ball, 1939; Stanley, 1990). Its mean elevation at Assiut is about 50 m above the sea level, and the mean width is about 11.5 km. The Nile channel, which represents the last geomorphological unit, ranges between 2800-200 m in width, and 9.5-6.3 m in depth (EGSMA, FINNIDA, 1991). It is characterised by about 55 river islands and several meanders. The present channel has changed throughout the evolutionary history of the recent Nile (Said, 1981; Embabi, 2004). Fig. 1 – Location map of the Nile valley in Assiut governorate and geological settings. Fig. 1 – Carte de localisation de la vallée du Nil au niveau du gouvernorat d’Assiout et données géologiques. 1: fluvial islands and Holocene deposits; 2: Nile Terraces and Wadi deposits; 3: scarp; 4: cave of El Gabrawi; 5: cave of El Mustagadda; 6: cave of the Bats; 7 and 8 caves of El Balayza. 1 : îles fluviales et dépôts holocènes ; 2 : terrasses fluviatiles du Nil et dépôts de wadi ; 3 : escarpement ; 4 : grotte d’El Gabrawi ; 5 : grotte d’El Mustagadda ; 6 : grotte de Bats ; 7 et 8 : grottes d’El Balayza. 3Natural caves are one of the most important forms which developed as a result of the carbonate dissolution. Their evolution and morphology are controlled by geological, climatic, geomorphological, hydrological, biotic and human factors (Sweeting, 1972; Jennings, 1985; Ford and Williams, 1989). The impact of these factors varies from one place to another and along the evolutionary history of the caves. Although the investigated area is currently affected by hyper-arid conditions, many natural caves can be observed. In addition, lots of other karst features, such karst cones, dolines, karst shafts, karren, and red soil, can be found on the surrounding plateaus (El Aref et al., 1987; Ahmed, 1993; Kuper, 1996; Baajens, 1997; Embabi, 2004; Kindermann et al., 2006). They were formed under humid palaeoclimatic conditions, especially during the Oligocene, Miocene, Pliocene, Pleistocene, and Early Holocene periods (Said, 1981, 1983 a and b; Ritchie et al., 1985; Linstadter and Kropelin, 2004; Kindermann et al., 2006; Bubenzer and Riemer, 2007). Recently, the role of hydrothermal dissolution has been confirmed by morphological and sedimentological indicators in some caves (hypogene caves) of the area. About five caves have been examined in the study area: Deir El-Gabrawi, Wadi El-Mostagada, The Bats cave of El-Badari area, and two caves in El-Balyza area (fig. 1). None of these caves have been studied for their geology, geomorphology or archeology. Geologically, most of the caves are formed in homogenous carbonates of the Drunka formation. Sites of the caves have been controlled mainly by joints and bedding planes. Moreover, the caves are more frequent where the bedding planes are intersected by joints and/or faults, and sometimes where the joints are oriented normal to the bedding planes. These geological structures represent the main conduits for water movement (Sweeting, 1972; Jennings, 1985; Ford and Williams, 1989). Some of these conduits are sealed by secondary calcite or filled by ore deposits, such as manganese and iron oxides. Association of these caves with the geological structures means that their locations are not related with a certain altitude. While some of them were found on upper and middle slopes of the valley scarps, others lie on lower slopes, almost at the level of the flood plain. 4Morphologically, most of the caves are open, small, and consist of one chamber. In general, the form of the cave entrances is irregular (fig. 2A). The dimensions of the chambers vary from 5 to 120 m in depth, 3 to 25 m in width and 2 to 15 m in height. The larger caves are characterised by collapsed blocks from the ceilings and walls. These falling blocks are mainly concentrated at the entrances and the middle parts of the cave chambers. Therefore, the floors are irregular. The walls, which are also uneven as a result of collapse, are sometimes penetrated by numerous cylindrical dissolution pipes, dissolution pockets, and enlarged bedding planes which are sometimes sealed by calcite and hard breccia. Occasionally, the walls are covered with red and black chemical precipitants. The roofs of the caves, especially the large ones such as El-Balayza and Bats Cave, are dome-shaped and jugged-looking due to the mechanical stress of the tension dome effect (Ford and Williams, 1989). These features have been supported by well-bedded and horizontally-bedded rocks of the Drunka formation. Cave sediments are divided into clastic sediments and chemical sediments. The first category is the most prevalent in the study area, and includes breakdown and weathering detritus which are classified as autochthonous sediments. Breakdown materials occurred in all the caves, its size ranged between chips and blocks; blocks are concentrated in the biggest caves as the Bats cave and El-Balayza caves. Mechanical stress, recent human activities, and earthquakes are the most probable explanations for wall and ceiling collapse. Weathering detritus, which represents insoluble materials, includes different sizes of chert bands, sand, and terra rosa. Sometimes, these materials are embedded in cemented cave breccia. No alluvial sediment is attested in the caves. Aeolian dust, which is classified as allochthonous sediment, has been blown into the caves by the wind. Presence of immense quantity of the dust on the cave floors means that these caves have not used for long time. Chemical sediments have been found clearly in El-Balayza caves, including different types of speleothems [e.g., small and irregular stalactites (helictite), scalenohedral calcite crystals (dogtooth spar), and flowstone]. Manganese oxide is related to fissure- and rift-like feeders on the floors of the caves. This feature can be observed in the hypogene caves (Klimchouk, 2007). However, there are no indications of Nile sediments inside the caves, even in those lying at low elevation, about 26 m above the floodplain. In addition, the absence of the Abbasiya gravels, which represent the Nile’s Early Middle Pleistocene 30 m terrace (Said, 1981), meaning that these low elevation caves were formed after the Early Middle Pleistocene to Early Holocene. It is probable that the upper caves originated at different periods. 5Archaeologically, no inscriptions or drawings have been observed inside the studied caves. Some fractured bones have been preserved beneath collapsed blocks at different sections of the floor sediments in El-Balayza cave; it seems that the bones are of different ages. Nevertheless, there is no strong evidence that these caves were used as burial places. Sometimes, locations of the caves were close to prehistoric settlements such as the Bats cave in El-Badary area. There are several indicators that other caves in the area and in the surrounding plateaus have been occupied during prehistoric periods (Vermeersch et al., 1994; Kindermann et al., 2006; Kuper, 1996; Darnell, 2008). Fig. 2 – The different kinds of the caves in study area. Fig. 2 – Les différents types de grottes observés dans la zone d’étude. A: El Balayza cave (number 7) as a dissolution cave; several breakdowns penetrated the floor at the entrance of the cave. B: Caves of rock-cut tombs (Senbi) at the Old Kingdom’s tombs at Meir area northwest of Assiut. C: Quarry-cave of El-Quseir. A : La grotte de El Balayza (numéro 7) est d’origine karstique ; plusieurs effondrements du plafond de la cavité ont entrainé la chute de blocs observables à l’entrée. B : Tombes (Senbi) datant de l’Ancien Empire sculptées dans des calcaires dans la région de Meir, nord-ouest d’Assiout. C : Carrière troglodyte de El-Quseir. 6Caves of rock-cut tombs are chambers dug out by man on the sides of the Nile Valley. Their entrances appear in carefully designed geometrical shapes (rectangular or square). With heights between 1 m and 1.9 m and widths between 0.6 m and 0.8 m (fig. 2B). The entrances lead to a chamber or several chambers at different levels, which are connected by corridors. The internal dimensions of the chambers range from 3 m to 8 m. They may be square or rectangular in shape and reach heights of up to 4 m. In general, the walls are straight, and polished, while the roofs are flat. Although the interior morphology of the caves differs from case to case, they were all used for the same purposes, i.e., religious centres and preparation for the afterlife. The latter were the primary reasons for all the different forms of creative architecture in Pharaonic periods, despite the differences in the methods used for designing and protecting the dead and their belongings from vandalism and theft (Bunson, 2002; White, 2003). The emergence of rock-cut caves in the Nile Valley dates back to the Old Kingdom period (4.575-4.134 ka BP) and it continued until the Middle Kingdom (4.04-3.64 ka BP) with some changes in internal styles (Badawy, 1954, 1966). Most caves are concentrated in the upper and middle slopes at altitudes more than 25 m above the floodplain. Only a few of them lie on the lower slopes, where they were left unfinished. Concentration of the caves on the middle and upper scarps can be explained by the geographical nature of the Nile Valley, which is narrow and surrounded by mountains. This elevated topography protected the tombs from thieves (Badawy, 1954). Moreover, the terrace–like shape of the upper slopes facilitated construction works, and these slopes are not affected by the dissolution process that is clear at the lower levels, because of water and humidity resulting from the agriculture activities on the floodplain. The rock-cut caves are mainly situated in middle Egypt, primarily in the Governorate of Assiut, where almost 500 sites can be found. Thus, they represent the most widespread kind of caves in Egypt. Location of rock-cut tombs in Assiut may be attributed to socio-political conditions in the Old Kingdom period, especially during the sixth dynasty. This period witnessed the appearance of some rulers and princes who had great authority and freedom in ruling their territories. One of the results of this freedom is that their tombs no longer spread around the pyramids of their kings as was common. Rather they spread in their territories, and this became customary in the first intermediate period. Rulers maintained this custom in the Middle Kingdom period to the extent that princes prided themselves on these high rock-cut tombs (Badawy, 1954). Their distribution pattern is irregular, with a majority of features on the western flank of the valley, especially at Assiut City. Most the tombs are concentrated in the west,as the ancient Egyptian believed that the sundown area is a place for eternal life (Green, 1989; Bunson, 2002; Dodson and Ikram, 2008). The caves are located at five different altitudes, and their sites were carefully selected. Most of them are located in areas which were not affected by geological weaknesses, such as faults, joints or bedding planes. In all cases they were dug in just one geological layer to avoid crossing bedding planes that represented zones of weakness. This clearly indicates people’s awareness of the principles of engineering and building. The existence of some unfinished tombs must be traced back to the presence of faults or joints enlarged by dissolution (grikes), as in the case of the sites of Senbi son of Ukh-Hotp of Senbi and Senbi son of Ukh-Hotp at Meir (Middle Kingdom). The faults in some other caves may be attributed to seismic activity to which they were exposed after their construction. This finding is confirmed by the fact that the Pharaonic drawings and inscriptions were found cut into fragments. A comparison of the Old and the Middle Kingdom tombs at Meir (50 km north of Assiut city) showed that the selection of the sites in the former period was more accurate, as corresponding locations were devoid of any tectonic weaknesses in contrast to the latter period, although they were both in the same area with the same kind of parent rock. Some of the caves still maintain their function as a cemetery. However, they are sparse and well protected by the Antiquities Authority including, for instance, some tombs of Drunka Mountain, Meir, and El-Hammamiya. While some tombs have not been completely discovered yet, others were not completely finished or destroyed in later ages. 7The ancient quarries which have been exploited since Pharaonic periods are a distinctive geomorphological feature in Assiut. They are considered as the second largest and most widespread type of caves after rock-cut tomb caves. They constitute large chambers excavated into the sides of the Nile Valley. Since the width of their entrances (4-13 m) is greater than their height (2-4 m), they can be differentiated from other types of caves when looked at from the floodplain. Their chambers are 7-20 m wide and 3.5-6 m high (fig. 2C). The general distribution of limestone quarries in the Nile Valley shows a concentration in middle Egypt, particularly in the Governorate of Assiut. Even though the number of quarry-caves on the east side equals the number on the west side, the caves are distributed regularly on the former, while they are concentrated to the south of Drunka Mountain in the latter (Harrell et al., 1996). Like caves of rock-cut tombs, most of them can be found at the upper and middle level scarps, at altitudes more than 30 m above the floodplain. Just few quarry-caves exist on the lower slopes; they usually comprise open quarries without chambers along the front of scarps. The location of quarry-caves was determined by the quality of rock rather than the ease of extracting stone and accessibility of location. The evidence for this is the fact that most quarries exist on the upper slopes of cliffs rather than beside to the valley bottom because the latter is of poorer quality (Aston et al., 2000). Some quarry chambers are intersected by faults and joints. This does not contradict or conflict with the quality of the rock although it sometimes helps the process of cutting and extracting stone. This was reflected in uneven walls. What mostly characterises this type is the internal morphology of its chambers. The walls are uneven, as most of them have a vertical stepwise shape resulting from the process of rock cutting and excavation. The roofs are flat and almost even. One of the most important features, especially in caves dating back to Pharaonic times is the presence of square rock-cut pillars (0.6-1 m thick, and 3-4 m apart) that carry the roof of the quarry and prevent it from collapsing. They are distributed in a regular net-like design, particularly in large quarries. Their outer surface is black due to the smoke emitted by the fireplaces, which were used for heating and lighting by inhabitants during modern times. Some of these pillars, especially the middle parts, have been destroyed by intentional acts of sabotage, and only small remains can be found on the roofs and the floors. Ancient Egyptians were certainly aware of safety rules and principles when setting up quarries. The evidence for this is that these quarries remain intact to this day thanks to the carefully designed- pillars. The only exception is the collapse of a part of the entrance of Deir El-Gabrawi quarry as a result of the heavy load of a recent flash flood that was transported to the roof of the quarry. The collapse did not occur due to a design fault with the quarry, but rather it was due to the destruction of the pillars at the entrance. Limestone quarries were formed in the Nile Valley between Cairo and Esna, from the end of the first dynasty to the eighteenth dynasty, as the importance of limestone as building stone decreased after that (Aston et al., 2000). Limestone quarrying obviously increased during the third dynasty, although it was not as perfect, accurate and huge as it had been during the fourth dynasty (Lucas, 1962). Some quarries were exploited more than once during the Pharaonic period and later times (Harrell et al., 1996). 8Caves constitute a distinctive geomorphological feature on the sides of the Nile Valley in the Assiut region. These caves can be classified into two types: dissolution caves and man-made caves. The latter type is divided into caves of rock-cut tombs and quarry-caves. The natural caves in the Nile Valley and surrounding desert were occupied during Palaeolithic and Neolithic times (Vermeersch, et al., 1994; Hassan et al., 1996; Kuper, 1996; Kindermann et al., 2006; Darnell, 2008). These caves were suitable places for the early Egyptians who abandoned the surrounding deserts and moved to the Nile Valley following an aridification of the climate around 5500 years ago. The floodplain was not suitable for settlement at that time due to the prevalence of swamps (Butzer, 1959). Moving from the deserts to the Nile Valley, as a result of climate change, gave a major impetus to Pharaonic civilisation “the first great change”. It seems that settlement in natural caves did not last for long. The evidence for this is lack of monuments inside them. Ancient Egyptians soon realised that taking shelter inside caves and settling at the margin of the floodplain did not satisfy their ambition towards building a great civilisation, and the Nile River became the most attractive factor, therefore, people left the sides of the Nile Valley and moved towards the river. This was “the second Great Change.” After the settlement of Egyptians on the floodplain, the process of building the ancient Egyptian society, which was based on religious beliefs, matured. One of the most important beliefs was the “afterlife” principle which conferred special sanctity on the dead and the tombs. That was why they returned to the Nile Valley scarps surrounding the floodplain to dig caves, not to live in them but to bury and maintain the dead. Natural caves had no role to play in this regard. The natural caves that were found during the Pharaonic period, have not been used until now due to several geological, geomorphological, and engineering problems. First, these caves originated at sites of weakness in rocks, such as bedding planes, faults, and joints. This contradicts the highly accurate engineering principles that ancient Egyptians sought to take into account when erecting tombs or buildings. Second, the walls of dissolution caves are not suitable for recording the manifestations of daily life, which were accurately recorded on the walls of Pharaonic tombs, whether through drawing, engraving or writing. This may be attributed to the presence of many karst features and chemical precipitates on their walls. Third, the prevalent fall of materials from the walls and ceilings of caves, and the presence of bones beneath them, might have created casualties (Tolan-Smith, 2004). Fourth, the uneven ground of caves and the large thickness of the breakdown have led to difficulties in creating burial chambers like those used in ancient Egyptian tombs. Fifth, their sizes may be more or less than the required size, and cannot be controlled in a way that meets the requirements of burial or lodging in them. This type of cave was not used due to another type of problem associated with their elevation. Some of these caves are either near the floodplain and, therefore, lack protection from annual floods, human threats, and dissolution process at lower levels, or at higher steep and unreachable levels. Even for those caves that were easy to reach, the previously mentioned geological and geomorphological factors interfered with their suitability for human exploitation. In short, the natural caves were not used because their morphology was “unengineered”, and their locations were "not selected". This did not appeal to the ancient Egyptians’ ambition to build a civilisation based on highly accurate engineering considerations and did not comply with the sanctification of the “afterlife” principle. On the other hand, quarry-caves that were established during the Pharaonic and Roman Ages, were reused in later ages as human shelters, and some of them are still used today. The biggest monasteries in the Governorate of Assiut were established in quarry-caves. Their origin has a historical dimension that dates back to the Roman persecution of Christians in Egypt, as Copts immigrated to the south of the Nile Valley to escape from persecution in the north. In addition, they provided shelter for some monks in later periods of time. Few rock-cut cave tombs are still used as archaeological tombs protected by the Authority of Antiquities. Until the 1960s rock-cut caves (devoid of monuments) and quarry-caves were used for temporary lodging during the flood season. Some of them are still used as shelters for outlaws. It is clear, from the history of cave use in the Nile Valley, that the environment of quarry-caves is considered the most preferable for lodging since the Coptic Era. They are the only type to be occupied to present, especially for religious purposes, perhaps due to the fact that they are wide, well-light, not deep and, therefore, more comfortable and safer. The author would like to thank Prof. N. Embabi for his valuable suggestions and discussions to improve the original manuscript, and would like to express his deep gratitude to Matthieu Ghilardi (CEREGE, UMR 6635-CNRS) for the fruitful remarks, translations into French and for editing the manuscript before its submission. Ahmed S. (1993) – Collapse and solution red breccia of the Issawia Sharq locality, Nile valley, Upper Egypt. Egyptian Journal of Geology 37, 187-203. Arnold D. (1991) – Building in Egypt. Pharaonic stone masonry. Oxford University Press, Oxford, 316 p.
Aston B., Harrell J., Show I. (2000) – Stone. In Nicholsen P.T., Show I. (Eds.) Ancient Egyptian Materials and Technology. Cambridge University Press, Cambridge, 5-77. Baajens A. (1997) – Geographical observations in the Western Desert of Egypt. Bulletin de la Société de Géographie d’Égypte 70, 203-213. Badawy A. (1954) – A history of Egyptian architecture: from the earliest times to the end of the old kingdom. Vol. 1. Studio Misr, Giza, Egypt, 212 p.
Badawy A. (1966) – A history of Egyptian architecture: the first intermediate, the middle kingdom, and the second intermediate period. Vol. 2. University of California Press, Berkeley, Los Angeles, 272 p.
Ball J. (1939) – Contribution to the geography of Egypt. Survey & Mines Department, Government Press, Cairo, Egypt, 308 p.
Barber M., Hubbard D. (1997) – Overview of the human use of caves in Virginia: A 10,500 year history. Journal of Cave and Karst Studies 59, 132-136. Baumgartel E.J. (1955) – The Cultures of Prehistoric Egypt, vol. 1. Oxford University Press, London, 122 p.
Baumgartel E.J. (1960) – The Cultures of Prehistoric Egypt, vol. 2. Oxford University Press, London, 164 p.
Brunton G., Caton-Thompson G. (1928) – The Badarian civilization and predynastic Remain near Badari. Bernard Quaritch, London, 128 p.
Bubenzer O., Riemer H. (2007) – Holocene climatic change and human settlement between the Central Sahara and the Nile Valley: archaeological and geomorphological results. Geoarchaeology: An International Journal 22, 607-620. Bunson M. (2002) – Encyclopedia of Ancient Egypt. Facts One File, New York, 462 p.
Butzer K. (1959) – Environmental and human ecology in Egypt during predynastic and early dynastic times. Bulletin de la Société de Géographie d’Égypte 32, 43-88. Culver D., White W. (2005) – Encyclopedia of caves. Elsevier Academic Press, London, 654 p.
Darnell D. (2008) – A desert crossrods: the Rayayna culture. The third international colloquium on predynastic and early dynastic Egypt. Britsh Museum, London, http://www.britishmuseum.org/pdf/Egypt_colloq_abstracts_7_08.pdf. Delannoy J.-J., Gauchon C., Hoblé F., Jaillet S., Maire R., Perrette Y., Perroux A.-S., Ployon E., Vanara N. (2009) – Karst: from palaeogeographic archives to environmental indicators. Géomorphologie: relief, processus, environnement 1, 83-94. Dodson A., Ikram S. (2008) – The tomb in Ancient Egypt. Royal and private sepulchers from the early Dynastic period to Roman. Thames & Hudson, London, 368 p.
EGSMA [The Egyptian Geological Survey and Mining Authority] (1981) – The Geological map of Egypt, scale 1:2000.000, Cairo, Egypt. EGSMA [The Egyptian Geological Survey and Mining Authority], FINNIDA (1991) – Topographic maps, scale 1:50.000, sheets: Manfalut, Abnob, Asyut, and Abu Tij. EGSMA. Cairo, Egypt. El Aref M.M., Abou Khadrah A.M., Lotfi Z.H. (1987) – Karst topography and karstification processes in the Eocene limestone plateau of El Bahariya Oasis, Western Desert, Egypt. Zeitschrift für Geomorphologie 31, 45-64. El Salam M. (2002) – Construction of underground works and tunnel in ancient Egypt. Tunnelling and Underground Space Technology 17, 295-304. Embabi N.S. (2004) – The geomorphology of Egypt: landforms and evolution, Vol. 1, The Nile Valley and the Western Desert. The Egyptian Geographical Society, Cairo, 447 p.
Ford D.C., Williams P.W. (1989) – Karst geomorphology and hydrology. Unwin Hyman, London, 601 p.
Gamble C.S. (1986) – The Paleolithic settlement of Europe. Cambridge University Press, Cambridge, 471 p.
Goldberg P., Sherwood S. (2006) – Deciphering human prehistory through the geoarcheological study of cave sediments. Evolutionary Anthropology 15, 20-36. Green J. (1989) – Life in ancient Egypt. Dover publication, New York, 49 p.
Gunn J. (Ed.) (2004) – Encyclopedia of caves and karst science. Taylor & Francis Books, New York, 1940 p.
Harrell J., Brown V., Masoud M. (1996) – Survey of Ancient Egyptian quarries. Egyptian Geological Survey and Mining Authority 72, 31. Hassan F.A., Hamdan M.A., Mahmoud A., Barich B. )1996) – Geoarchaeology of a cavern in Wadi El-Obeid area, northwest of Farafra Oasis, Egypt. Proceedings of the 3rd International Conference on the Geology of Arab World, Cairo University, Cairo, 677-691. Jennings J.N. (1985) – Karst Geomorphology. Blackwell, New York, 293 p.
Kindermann K., Bubenzer O., Darius F., Nussbaum S., Pollath N., Riemer H., Smettan U. 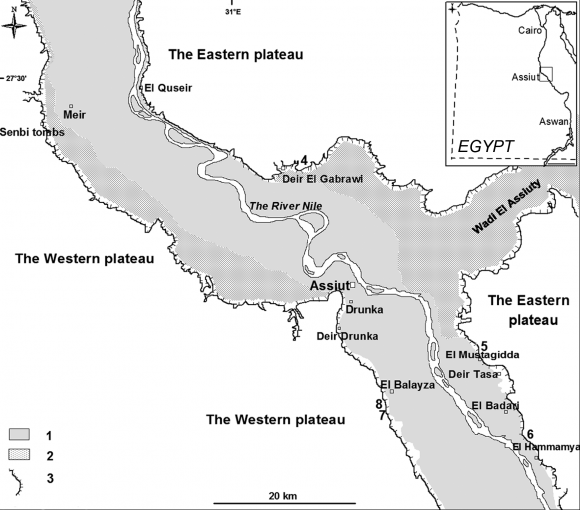 (2006) – Palaeoenvironment and Holocene land-use of Djara, Western Desert of Egypt. Quaternary Science Reviews 25, 1619-1637. Klimchouk A. (2007) – Hypogene Speleogenesis: hydrogeological and morphometric perspective. National Cave and Karst Research Institute, Special Paper No. 1, 106 p.
Klitzsch E., List F., Pohlimann G. (1987) – Geological map of Egypt. 1:500000, NG 36 NW Asyut. Conoco Coral and the Egyptian General Petroleum Corporation, Cairo, Egypt. Kuper R. (1996) – Between the oases and the Nile-Djara: Rohlfsʼ cave in the Western Desert, interregional contacts in the later prehistory of northeastern Africa. Poznan Archaeological Museum, 81-91. Linseele V., Marinova E., Van Neer W., Vermeersch P. )2009 (– Sites with Holocene dung deposits in the Eastern Desert of Egypt: visited by herders? Journal of Arid Environments 74, 818-828. 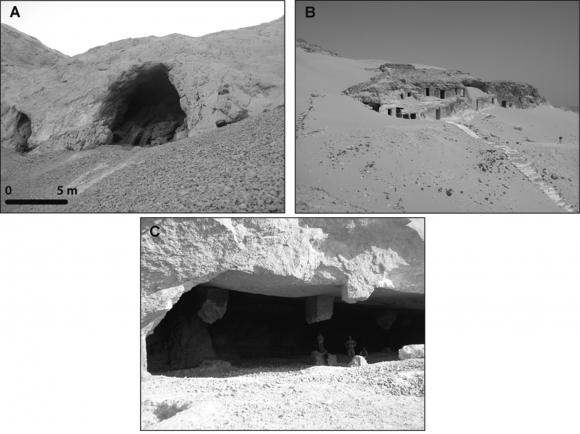 Linstädter J., Kröpelin S. (2004) – Wadi Bakht revisited: Holocene climate change and prehistoric occupation in the Gilf Kebir region of the eastern Sahara, SW Egypt. Geoarchaeology 19, 753-778. Lucas A. (1962) – Ancient Egyptian materials and industries. 4th edition revised by J.R. Harris, Edward Arnold Publishers, London, 523 p.
Mlekuž D., Budja M., Payton R., Bonsall C. (2008) – “Mind the gap”: caves, radiocarbon sequences, and the Mesolithic-Neolithic transition in Europe. Lessons from the Mala Triglavca rockshelter site. Geoarchaeology 23, 398-416. Moeyersons J., Vermeersch P., Van Peer P. (2002 (– Dry cave deposits and their palaeoenvironmental significance during the last 115 ka, Sodmein Cave, Red Sea Mountains, Egypt. Quaternary Science Reviews 21, 837- 851. Mouret C., Ostermann J. (2001) – Human use of caves in Perigord, Dordogne, France. 13th International Congress of Speleology, 4th Speleological Congress of Latin América, and Caribbean 26th Brazilian Congress of Speleology, Brazilian Society of Speleology, 595-601. Psomiadis D., Dotsika E., Zisi N., Pennos C., Pechlivanidou S., Albanakis K., Syros A., Vaxevanopoulos M. (2009) – Geoarchaeological study of Katarraktes cave system (Macedonia, Greece): isotopic evidence for environmental alterations. In Ghilardi M., Fouache E., Chiverrell R. (Eds.) Geoarchaeology: Human-environment connectivity. Géomorphologie: relief, processus, environnement 4, 229-240. Ritchie J., Eyles C., Haynes C. (1985) – Sediment and Pollen evidence for an early to mid- Holocene humid period in the eastern Sahara. Nature 314, 352-355. Said R. (1981) – The Geological evolution of the River Nile. Springer-Verlag, New York, 151 p.
Said R. (1983a) – Proposed classification of the Quaternary of Egypt. Journal of African Earth Sciences 1, 41-45. Said R. (1983b) – Remarks on the origin of the landscape of the eastern Sahara. Journal of African Earth Sciences 1, 153-158. Sandford K.S. (1934) – Paleolithic Man and the Nile Valley in Upper and Middle Egypt. Chicago University Press, Oriental Institute Publication No. 3, 131 p.
Sandford K.S., Arkel W.J. 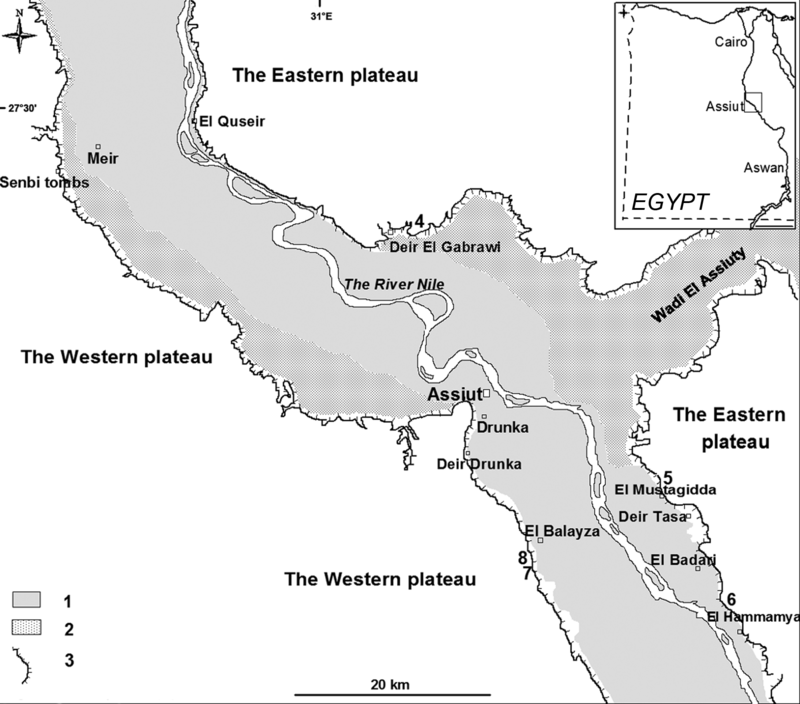 (1939) – Paleolithic man and the Nile-Faiyum divide: A study of the region during Pliocene and Pleistocene times. Chicago University Press, Oriental Institute Publication No. X, 77 p.
Stanley D.J. (1990) – Recent subsidence and northeast tilting of the Nile Delta. Marine Geology 94, 147-154. Sweeting M.M. (1972) – Karst landforms. London, Macmillan, 362 p.
Tolan-smith C. (2004) – Human occupation of caves. In Gunn J. (Ed.) Encyclopedia of Caves and Karst Science. Taylor & Francis Books, New York, 919-924. Vermeersch P.M., Van Peer P., Moeyrsons J., Van Neer W. (1994) – Sodmein Cave site, Red Sea Mountains (Egypt). Sahara 6, 31-40. White B. (2003) – Ancient Egyptian provides an early example of how a society’s worldview drives engineering and the development of science. The Strategic Technology Institute, www.strategic-tech.org. Woodward J.C., Goldberg P. (2001) – The sedimentary records in Mediterranean rockshelters and caves: archives of environmental change. Geoarchaeology: An International Journal 16, 327-354. La ville et le gouvernorat d’Assiout sont localisés à environ 375 km au sud du Caire, en Moyenne Égypte (fig. 1). A cet endroit, la vallée du Nil est encaissée au maximum de 240 m dans un plateau constitué de roches carbonatées (essentiellement des calcaires blancs à gris très bien lités) d’âge éocène (Said, 1981; Klitzsch et al., 1987). Le Nil s’écoule à cet endroit selon une direction S/N, à environ 50 m au-dessus du niveau moyen de la mer et délimite naturellement le désert Occidental du désert Oriental. L’une des caractéristiques morphologiques de l’escarpement qui limite le plateau de part et d’autre de la vallée du Nil est la présence de nombreuses cavités/grottes qui ont des origines diverses et ont occupé au cours de l’histoire différentes fonctions. Le présent article a pour but d’établir une typologie de ces grottes et de comprendre leur intérêt en termes de logiques d’implantation des sépultures de l’époque dynastique pour les anciens Egyptiens. Le premier type de cavité rencontré est d’origine karstique (fig. 2A) : ces grottes aux dimensions variables sont autant d’héritages morphoclimatiques d’âge tertiaire à quaternaire récent (Said, 1981, 1983 a et b ; Ritchie et al., 1985 ; Linstadter et Kropelin, 2004 ; Kindermann et al., 2006 ; Bubenzer et Riemer, 2007), témoignant de l’existence de périodes plus humides qu’actuellement. À l’intérieur, on note la présence de spéléothèmes et d’éboulis, mais aucune trace de sépulture datée de l’Egypte ancienne n’y a été identifiée. Ces grottes sont encore aujourd’hui délaissées d’un point de vue scientifique et très peu ont fait l’objet d’études paléoclimatiques. Les deuxième et troisième types de grottes sont d’origine anthropique et sont généralement associés soit à des tombes datant de l’Ancien Empire creusées dans une seule et même strate (fig. 2B), soit à d’anciennes carrières dont les matériaux extraits servaient à la construction de temples (fig. 2C). Dans le premier cas, la roche en place d’origine calcaire a été creusée et aménagée afin d’accueillir des sépultures de l’époque pharaonique qui répondent à un style architectural et des dimensions bien précis. Dans le second cas, les anciennes carrières d’extraction de blocs calcaires, nombreuses le long de la vallée du Nil en Moyenne Égypte, sont également des vestiges archéologiques dans la mesure où leur période d’exploitation correspond à la période dynastique. Dans le cadre de futures recherches, il serait utile de pouvoir étudier certains spéléothèmes afin de reconstituer les paléoenvironnements fini-pléistocènes et du début de l’Holocène. À ce jour, aucune étude de ce type n’a été entreprise en Moyenne ou Haute Égypte. Fig. 1 – Location map of the Nile valley in Assiut governorate and geological settings. Fig. 1 – Carte de localisation de la vallée du Nil au niveau du gouvernorat d’Assiout et données géologiques. 1: fluvial islands and Holocene deposits; 2: Nile Terraces and Wadi deposits; 3: scarp; 4: cave of El Gabrawi; 5: cave of El Mustagadda; 6: cave of the Bats; 7 and 8 caves of El Balayza. 1 : îles fluviales et dépôts holocènes ; 2 : terrasses fluviatiles du Nil et dépôts de wadi ; 3 : escarpement ; 4 : grotte d’El Gabrawi ; 5 : grotte d’El Mustagadda ; 6 : grotte de Bats ; 7 et 8 : grottes d’El Balayza. Fig. 2 – The different kinds of the caves in study area.Fig. 2 – Les différents types de grottes observés dans la zone d’étude. A: El Balayza cave (number 7) as a dissolution cave; several breakdowns penetrated the floor at the entrance of the cave. B: Caves of rock-cut tombs (Senbi) at the Old Kingdom’s tombs at Meir area northwest of Assiut. C: Quarry-cave of El-Quseir. A : La grotte de El Balayza (numéro 7) est d’origine karstique ; plusieurs effondrements du plafond de la cavité ont entrainé la chute de blocs observables à l’entrée. B : Tombes (Senbi) datant de l’Ancien Empire sculptées dans des calcaires dans la région de Meir, nord-ouest d’Assiout. C : Carrière troglodyte de El-Quseir. Ashraf Aboul-Fetooh Mostafa, « Caves of the Nile Valley (Governorate of Assiut, Middle Egypt): a long-term interaction between human societies and their environment », Géomorphologie : relief, processus, environnement, vol. 18 - n° 1 | 2012, 37-44. Department of Geography - Faculty of Arts - Assiut University - Assiut - Egypt (Fetooh2@maktoob.com).